Sichuan province is the birthplace of many dishes that are well-received globally. Sichuan food, originated from the Southwestern region of China, is the most widely served cuisine in China itself. The dishes of Sichuan cuisine are known for their deep and rich flavours, especially the taste of Sichuan pepper which is rare in other regional cuisines. Sichuan food is most well-known for its hot and spicy flavor, though it may sport sweet and sour flavors too. The most commonly used spices you can find in most households and eateries are "The Five Fragrances" which consist of fennel, pepper, aniseed, cinnamon, and clove; chili and Sichuan pepper. 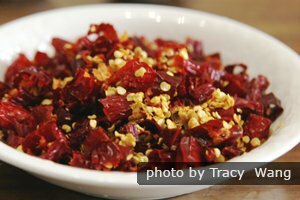 Dried chili peppers, one of the most common seasonings of Sichuan cuisine. Sichuan cuisine cannot do without Sichuan pepper, black pepper, chili, broad bean chili paste, shallots, ginger, and garlic. These are must-have seasonings that bring out the intense flavors the dishes are renowned for. The other fresh produce used range widely from pork to beef, fish, vegetables, and even tofu. The cooking methods of Sichuan cuisine vary according to texture and bite required for each specific dish. The array of cooking methods include stir-frying, steaming, braising, baking, and the most popular of which is fast-frying. Mapo (/maa-por/) tofu is bean curd served in a chili-and-bean-based sauce — usually a thin, oily, and bright red suspension — and often topped with minced meat; pork or beef. Seasonings include water chestnuts, onions, other vegetables, or wood ear fungus. 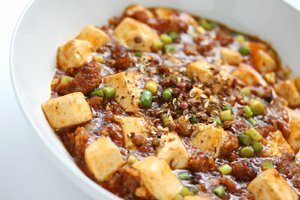 The taste of mapo tofu is fittingly described as numbing, spicy-hot, fresh, tender and soft, aromatic and flaky. Mapo tofu is not exclusive to Sichuan province and is easy to find outside of China. Learn more on How to Cook Mapo Bean Curd. 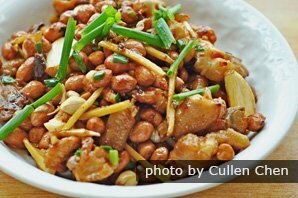 Kung Pao Chicken is its Cantonese name, and read as Gongbao Jiding (宫保鸡丁 /gong-baow jee-ding/ &apos;Palace-Protected Chicken Cubes&apos;) in Mandarin. The dish is prepared by frying diced chicken and dry red pepper with golden peanuts. 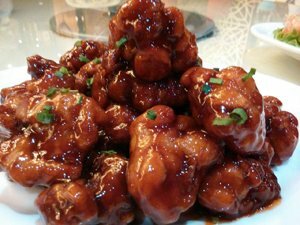 Spicy diced chicken is more popular among Westerners than its counterpart mapo tofu. This is because it is usually less spicy, or not at all, when served abroad and outside Sichuan province. Learn how to cook Kung Pao Chicken. Fuqi Fei Pian, the brainchild of Guo Zhaohua, is made of thinly sliced beef (or bovine lung or tongue) seasoned with chili oil. Zhaohua and his wife sold their vinegar-ized beef slices for a living by trundling a small cart along the streets. As their beef slices were aromatic and delicious, no one could resist visiting their stall. In honor of the couple, patrons coined the name — Husband and Wife Lung Slices. Sichuan hotpot, like most of the cuisine in this humid and populous province, is numbingly spicy. The broth is flavored with chili peppers and other strong-tasting herbs and spices. The main ingredients include hot pepper, Chinese crystal sugar, and wine. Slices of kidney, chicken breast, beef tripe, goose intestines, spring onion, soy bean sprouts, mushrooms, duck, and sea cucumber are the usual meats used in the dish. Learn more about Hot Pot. Dandan noodles is yet another quintessential Sichuan dish that has received international attention and hence may come in different versions. Unlike the usually watered down ones outside Sichuan, dandan noodles in Sichuan province embody a combustion of flavors — savoury, nutty, spicy, and smoky. The noodles are drenched in chili oil with vegetables, Sichuan pepper, and minced pork served on top. There has been a misconception about this dish being oily and heavy. However, when done right in Sichuan province, the stir-fried green beans are supposed to be light and crunchy. Also known as snap beans or string beans, the beans are prepared with the cooking technique "dry-frying" where lesser oil is needed and a longer frying time required. This dehydrates the beans, creating a crispy outer layer. The beans are subsequently tossed sufficiently in chili-flavored oil, Sichuan pepper, scallions, garlic, and ginger. Sichuan food is famous in China and abroad, and served at every corner of the world. However, the most authentic Sichuan food is still to be found at its hometowns: Chengdu and Chongqing. Our customers enjoying their dinner with our colleague Kim at a restaurant in Guilin. 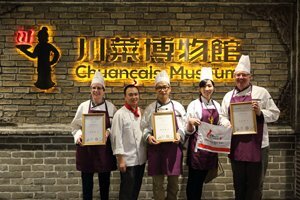 To have a taste of authentic Sichuan food, our tours can take you to some of the best local restaurants. 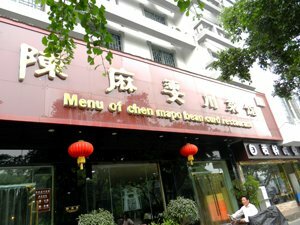 Our Chengdu tours combine must-see attractions in Chengdu with meals in carefully selected restaurants. 12-Day Beijing, Xi&apos;an, Chengdu, Guilin, and Hong Kong Cuisine tour — explore the most popular destinations in China and savor local Chinese food in each city. 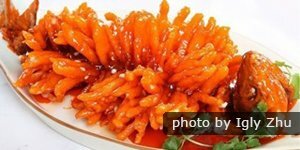 Or you can contact us and we can also tailor-make a Chinese food tour for you. Let us know your interests and requirements.